Councils’ have been announcing a swathe of new plans for new ‘public spaces protection orders’ banning activities in public spaces. These new orders show the dangers of these arbitrary, open-ended powers, with towns and cities planning bizarre new offences such as ‘loitering’, carrying out card tricks, or failing to be carrying a poop bag. In every case, these new laws target an activity that is not in itself problematic or criminal. The entirely innocent and anodyne will be punished. There will be new criminals created: the mother who smoked a cigarette in a children’s playground, the busker who played a tune on a non-designated pitch, or an elderly person who fed the birds. These new laws show councils moving directly into the realm of law enforcement, in some cases giving their officers powers to ‘disperse’ people from the vicinity. In addition, we see the blurring of any distinction between actions that are harmful and criminal, and actions that are merely not to the taste of others. The PSPO can be applied against ‘detrimental’ behaviours, a category that is increasingly being applied to mean anything that some people don’t like. This blurred distinction between crime and annoyance erodes the criminal law itself, just as much as it does our public liberties. Here are the latest consultations and orders. It is notable that many of these consultations are significantly loaded, in some cases not even asking people whether they are for or against the measures (instead asking whether they have been ‘affected’ by an issue, or whether they feel ‘safe’ in the town centre). However, they normally have a comments box in which to register opposition. MANSFIELD – Plans to criminalise: smoking in a children’s play area; public drinking; failing to ‘produce when requested a receptacle for picking up dog faeces’. The PSPO will also create ‘dispersal zones’, within which council officials and police officers can order people to leave the area – it will be a criminal offence for them to refuse. See the order; respond to the consultation. CHESTER – A wide-ranging PSPO banning the following activities: rough sleeping; taking ‘intoxicating substances’, or having intoxicating substances in your possession; making any verbal or non-verbal request for money, including begging or busking outside designated pitches; bird feeding (except ‘with the express permission of the council’). See the order; respond to the consultation. SWINDON – Planning an order restricting: dogs off leads, alcohol, begging, pavement art, street trading, ‘assertive or aggressive charity collection’, and skateboarding. See the order and the consultation on the council’s website. CROYDON – Linked to a major redevelopment project, the Croydon PSPO is aiming to ‘clean up’ the town centre, including proposals to ban: street drinking, noise (e.g. from shops or loud speakers), ‘rowdy and/or inconsiderate behaviour’, ‘groups of people acting in a manner which may cause harassment, alarm or distress’, face-to-face fundraising, skateboarding or rollerblading in pedestrian areas. See the text of the consultation. See criticisms of this PSPO, in the Guardian, and from a local Green councillor. SOUTH DERBYSHIRE DISTRICT COUNCIL – will propose a PSPO requiring dog walkers to always be carrying poop bags. See an article about the plans. (This follows a similar measure from Daventry District Council). NEWHAM COUNCIL – is proposing a PSPO cracking down on ‘boy racers’, yet rather than prohibiting car racing, the order will ‘prevent drivers from entering the retail parks after 8pm unless they are visiting one of the restaurants’, creating an offence much broader than the alleged target. See the council’s description of the order. CORBY – proposing a PSPO prohibiting: begging; consuming ‘intoxicating substances'; being in possession of an open container of alcohol; and acting in a ‘manner that causes alarm, harassment or distress as a result of consuming alcohol or taking intoxicating substances’. 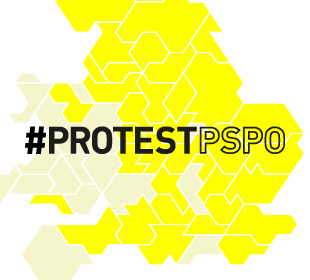 The PSPO consultation is here. LIVERPOOL – planning a PSPO covering the whole city centre, and criminalising: begging, consumption of alcohol, placing ‘unauthorised structures in public places’. See the order and consultation here. Sign a petition against the order here. EAST CAMBRIDGESHIRE DISTRICT COUNCIL – planning a PSPO to prohibit ‘loitering’ outside particular buildings and on certain public rights of way. See a description of the order here. GRAVESHAM BOROUGH COUNCIL – planning a wide-ranging PSPO, criminalising lying down in public, begging, street drinking, unauthorised busking and pigeon feeding. Sign a petition against the order here. KENSINGTON AND CHELSEA – passed a PSPO supposedly targeted at ‘super-rich’ boy racers revving their sports cars, but which is drafted broadly and so could affect a much broader group. The order prohibits ‘Revving of engine(s); (such as to cause a public nuisance)’, ‘Repeated sudden or rapid acceleration; (such as to cause a public nuisance’, ‘Leaving the engine of a stationary motor vehicle to run idle (such as to cause a public nuisance)’, ‘Sounding horns (as to cause a public nuisance)'; ‘Playing Music (as to cause a public nuisance)'; ‘Using abusive language towards another person'; and ‘Causing obstruction on a public highway, whether moving or stationary, including driving in convoy.’ The order is here.